Nearly a decade ago, William & Mary launched a new scholarship program designed to bring students to the university who, by any measure, would be considered among the nation's very best. It was called the Murray Scholars Program. Made possible through a leadership gift by Jim Murray J.D. '74, LL.D. '00 and his wife Bruce, it has been a remarkable success. Today, the program continues to thrive, now under a new name - the 1693 Scholars Program. In the fall of 2012, the program was able to expand by two additional scholars thanks to the generous support of the Stamps Family Charitable Foundation. E. Roe Stamps IV and Penny Stamps are deeply committed to education, supporting projects and scholarships at over 35 universities nationwide. In the fall of 2014, the Stamps Family Charitable Foundation increased their support and helped the program enroll an additional Stamps 1693 Scholar. Therefore, we are now able to enroll three Stamps 1693 Scholars in every incoming class. Meet our current Stamps 1693 Scholars. In the fall of 2014, we enrolled our first Estes Family 1693 Scholar thanks to the support of Rob and Jean Estes. In the Fall of 2018, we will enroll our second and third Estes Family 1693 Scholars. Jean Berger Estes graduated in 1975 from William & Mary. She was a member of Pi Phi sorority and majored in elementary education. She co-chaired her class’s 30th reunion gift committee and served as a trustee of the William & Mary Foundation from 2006-2012. Rob Estes ‘74 was a business major and member of Pi Kappa Alpha fraternity. He has served on the class of 1974’s 30th and 40th reunion gift committees and has been a trustee of the Mason School of Business’s Foundation board since 2004. He is the president and CEO of Estes Express Lines. Rob and Jean Estes live in Richmond, VA. Their son, Webb, is also a graduate of W&M ‘06 and MACC ‘07. Our first Watkins Family 1693 Scholar and our first Gore 1693 Scholar enrolled in the fall of 2016. H. Thomas Watkins, III ’74 and Wendy R. Watkins of Lake Forest, Illinois, and their family created the Watkins Family 1693 Scholarship Endowment. A former Tribe football player, Tom earned a bachelor’s in accounting from the university and has had a successful career in the healthcare industry. He currently serves as vice rector on the university’s Board of Visitors and is an emeritus member and former chair of The College of William & Mary Foundation Board. Tom also serves as trustee of the William & Mary Business School Foundation and is a member of the For the Bold campaign cabinet. Two of Tom and Wendy's children, Catherine ’05 and Hays ’11, earned degrees from the university, and Tom's father, Hays T. Watkins Jr. (HON ’82), is a former Rector of the William & Mary Board of Visitors. In 2013, Sarah (Sally) Ives Gore ’56 of Newark, Delaware, established the Gore 1693 Scholarship Endowment. Sally, an English major at William & Mary, was a member of Kappa Kappa Gamma. She participated in a myriad of student activities — including William & Mary Chorus, Kappa Delta Pi, Future Teachers and the Judicial Council. She also worked atThe Flat Hat and the Colonial Echo. Sally has served William & Mary on numerous committees and boards — including the Board of Visitors, The College of William & Mary Foundation, and the School of Education Development Board. In 1998, Sally was honored with the Alumni Medallion, the William & Mary Alumni Association’s highest honor. Our first Girton and Bright Families 1693 Scholar will enroll in the Fall of 2018 thanks to the support of W. Edward Bright '78. Ed is a retired corporate attorney and the former chair of the Swem Library board of directors. 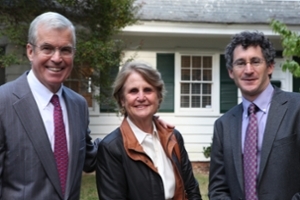 He is an emeritus trustee of the William & Mary Foundation. Ed has also served as a member of his 25th Reunion Committee and the New York Auction Committee. Ed is a Phi Beta Kappa graduate of William & Mary where he majored in Government and Economics. He also has a law degree from the University of Virgnia. Ed resides in Vienna, VA.